You will find the treasure of endemic species and the Obô, our Atlantic rain forest of high altitude which covers about 30 % of the country, crossed by rivers and waterfalls everywhere - if you take the trouble to go inland! In 1988 scientists of fauna classified the forests of Sao Tomé and Principe as the second most important in terms of biological interest of the 75 forests of Africa. The Atlantic rain forest of high altitude, Obô, contains the majority of the fauna and flora that gave Sao Tomé and Principe its classification. This, obviously opens the way to the practice of eco-tourism, which could be an elegant way of stimulating national economy while preserving natural patrimony. Over the last few years, an increasing interest has been shown in eco-tourist activities on the archipelago, but the sector is still in its beginning. Trekking is now organized on various levels and in combination with staying overnight at the old plantations (the 'roças'). The EU sponsored ONG, ECOFAC is working with land mapping of existing resources as well as sustainable and rational management of natural resources in Sao Tomé and Principe. 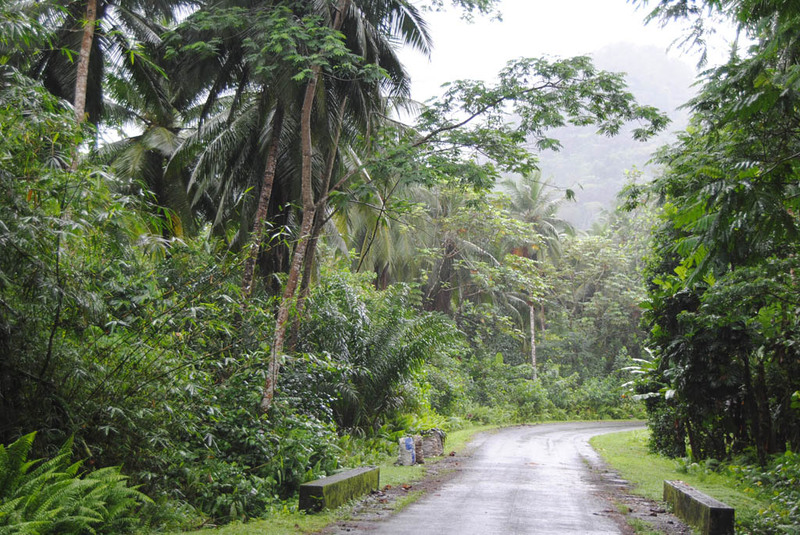 Last year, the natural park Obô was oficialized due to the efforts of ECOFAC, São Tomé. Of the about 700 species existing on the archipelago, hundreds are endemic. One example is the giant begonia that reaches 3m of height, a tree-like fern and various orchids of which some are endemic. Within bird life endemism is very pronounced. Of the 55 existing species of birds in Sao Tomé and Principe, between 15 and 26 are endemic (depending on the system of classification) and others, although not endemic, simply belong to the exclusive company of the rarest birds of the world. The Sao Tomé Grosbeak (Neospiza concolor) of Sao Tomé was only seen twice : in 1888 and in 1991. It has been observed in the area around Xufe-Xufe in the lowland primary forest of the South-Western coast as well as shrike and short-tail. The access to this part of the island is, however, only possible by boat and includes a good part of hiking (with a guide !) and in order to have the time to do observation, it is necessary to camp. In the area around Queijo, equally on the south-western coast, but requiring less trekking, all endemic species have been observed, except for Grosbeak, pigeons and Sao Tomé Scop's owl (Otus hartlaubi). The Lesser Grey Shrike (Lanius minor), after 65 years of disappearing, has now been seen again, as well as Dwarf Olive Ibis, (Bostrychia bocagei) which has been spotted in the area of abandoned plantations between Umbugu and Martin Mendes rivers (about 1 hours walk from Roça de São João). Most of the island's forest birds have been observed on the track to Lagoa Amélia, like Sao Tomé Giant Sunbird and Sao Tomé Olive Pigeon. On the way, at Esperança (secondary rain forest), the island's subspecies of White-eye (Zosterops ficedulinus) have been observed. In the area around Lagoa Amélia, São Tomé Scop's Owl has been spotted. As the area of the Obô has not yet been fully analyzed, it may be that the forests still hide other ornithological and botanical treasures that are still to be discovered. Do also see ECOFACs Guide des oiseaux de São Tomé et de Príncipe by Patrice Christy and William Clarke where illustrations and text were extracted from. The island's savanna birds, (especially the Red-necked Francolin "Francolinus afer afer"), the Harlequin Quail (Coturnix delegorguei), the Laughing Dove (Streptopelia senegalensis), the Red-headed Lovebird (Agapornis pullarius), the African Masked Weaver (Ploceus velatus) and the Village Weaver (Ploceus cucullatus nigriceps) and Golden-backed Bishop (Euplectes aureus), the Blue Waxbill (Uraeginthus angolensis) and the Yellow-fronted Canary (Serinus mozambicus) have been seen on the track between Diogo Nunes and Lagoa Azul on the northern coast of São Tomé. From October to March this is also a good itinerary for sighting of Palaearctic and afro tropical migrants. This observation can also be done in the town of São Tomé itself and the surrounding areas, especially in the fields between the town and the airport. The most interesting in central African terms are the Golden-backed Bishop and the Blue Waxbill.